Local musician Gregg Brown visits Illinois State University's campus with a box of free CDs. An Illinois native, Gregg Brown grew up immersed in the counterculture ideas of peace and social change, themes that can be noted in his music on tracks such as “1967”. Heavily influenced by the hippie movement of the 1960s and the New Age movement of the 1990s, Brown has released two albums to date, Another Time, Another Being in 2006, and Ancient Now: Be this past year. Brown cites his musical inspirations as Jefferson Airplane, The Doors, and Grateful Dead. The result is a unique and authentic sound that blends elements of new age, folk, and old-school rock that are a growing rarity in the days of auto-tune. It wasn’t until the early 1990s that Brown began to make music, starting out with a custom-made dulcimer from a friend, before adding guitar and piano to his musical repertoire. He says he was inspired in his 40s to “pick up music” because of a personal philosophy that he says helps him learn something new every decade. “So I started to just like find little tunes…the lines of a melody and whether it was right. And so that was the beginning of that,” recalls Brown. Brown soon began to see music as more than just a hobby, and began to record. Brown has an extensive collection cassette tapes with original music. "This is all from the 2000s (gesturing to the CDs). The cassettes are from the 90s. So I got two boxes of a hundred, you know, front and back. 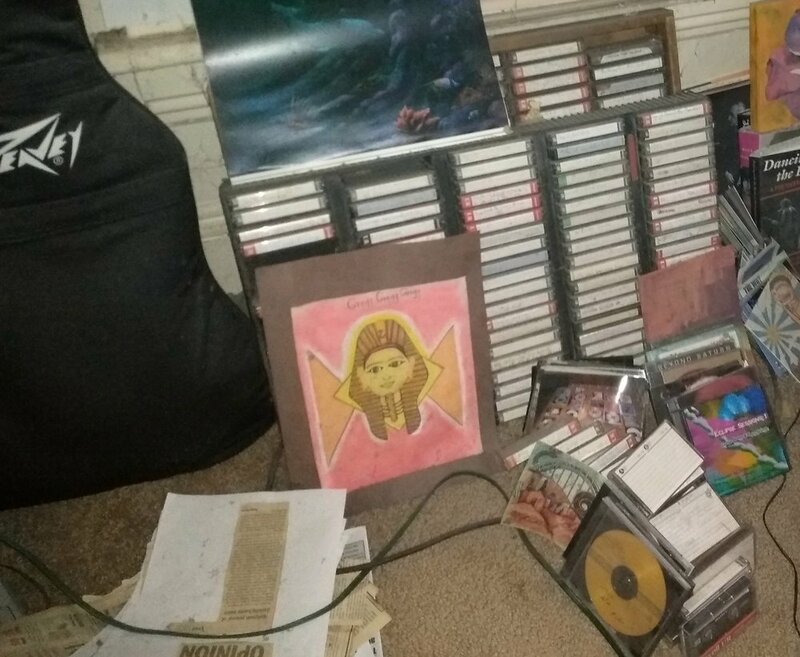 That's 200 cassettes right there of original music," Brown says proudly, referring to a mass of cassette tapes and CDs in his living room, each marked with individual songs and recording dates. He hopes to one day get his massive catalog transferred to a digital format. Brown graduated from Illinois State University in 1988 with a Bachelor’s Degree in Sociology, a move he referred to as, “the course of least resistance.” This achievement put him at odds with some of his beliefs, but would later give him a platform to share his message through both his music and activism. Brown occasionally played at venues in the area, but has gained perhaps the most notoriety for his frequent appearances at his alma mater in Normal, IL. Weather permitting, Brown will show up in the middle of campus, a guitar in one hand and a sign in the other, ready to speak a message of peace to those who are willing to listen. On the Illinois State University quad, Brown holds up a sign endorsing the use of cannabis as a medical treatment. Over the last two decades, Brown has become somewhat ingrained in the Illinois State experience, exposing students and faculty alike to a different perspective than they may have been accustomed to. Frequent topics include the state of political discourse, peaceful solutions to global conflict, and the legalization of cannabis for cancer treatment. He is inspired by young adults who are taking active roles in protesting the wrong in the world, much as he did in his youth, in what he views as a deeply divided society. He sees young people as imperative to help bring out positive cultural change for the future. This article is funded by the Illinois State University Friends of the Arts. John Yeley is a Bloomington-Normal based writer, artist, and Criminology student at Indiana State University. He has previously studied Journalism at Butler University, and will be entering law school this fall to pursue his Juris Doctor degree. Sign up to receive news about upcoming events and website updates.